Denis Sullivan had his best European Senior Tour finish for eight years at St Andrews. Cork’s Denis O’Sullivan came within a whisker of becoming the second oldest winner in the history of the European Senior Tour when he finished tied for second behind maiden winner Santiago Luna in the SSE Scottish Senior Open at Fairmont St Andrews. Neil Coles won the Lawrence Batley Seniors Open at the age of 67 and 276 days in 2002, beating his own record of 65 and 252 days from the 2000 Microlease Jersey Seniors Open. O’Sullivan, who was seeking his eighth Senior Tour win eight years after his last success, would have been 65 years and 304 days with a win at the Home of Golf. Instead, a closing level par 72 left him a stroke behind Luna and tied with 59-year old Sam Torrance on four under par. His consolation prize came in the form of a cheque for € 24,641 - his biggest since he earned €64,06 for finishing joint second in the Ryder Cup Wales Seniors Open eight years ago. Not only that, he moved up to 21st in the Order of Merit. Philip Walton had a tough finish at Fairmont St Andrews. Picture Fran Caffrey/www.golffile.ieWith wind gusting up to 20mph making playing conditions challenging, the lead changed hands several times across the final round with early pacesetter O’Sullivan battling to become only the second player to win past the age of 65. He was tied for the lead with Dubliner Philip Walton with eight holes to go but bogeys on the 14th and 17th saw him eventually slip from the top of the leadboard, before a birdie on the last eased some of the pain. Walton, who like O’Sullivan was a shot behind overnight pacesetter Peter Fowler starting the day, birdied the fifth to turn in 34 and join his compatriot at the top on five under with nine to play. But the 1995 Ryder Cup hero bogeyed the par-five 12th and then suffered a late collapse with a calamitous double bogey six at the 14th leading to four closing bogeys. Des Smyth surged to joint 14th after a 71 but the day belong to Luna, who held off a determined challenge from newly named Great Britain and Ireland Seve Trophy skipper Torrance to seal a memorable return to St Andrews, 15 years after defeating Tiger Woods in the Dunhill Cup. The Spaniard carded a closing one under par round of 71 to finish on five under par 211, one shot clear of O’Sullivan and course designer Torrance, who turns 60 next Saturday. The Scot, clearly rejuvented by being called up by Paul McGinley to skipper GB&I in France in October’s Seven Trophy, came up just short in his bid for one more victory in his 50s. Luna landed his maiden Senior Tour title in just his sixth event and was suitably chuffed. “It is difficult to explain how I feel,” said Luna, whose only European Tour victory was the 1995 Madeira Islands Open. “It has been a long time. On a golf course like this, it is very tough to win. Santiago Luna captured his maiden European Senior Tour title in just his sixth start at the SSE Scottish Senior Open. Picture © Getty Images“Yesterday was very tough with the rain, but I putted so well. I’m so happy to win, especially somewhere like this because it is difficult for me to play here. In Madrid, we don’t have this sort of wind. 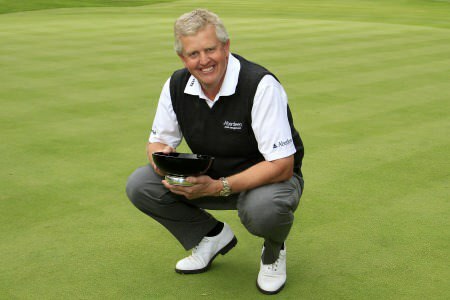 Luna, whose previous best finish on the Senior Tour was tied eighth in the Bad Ragaz PGA Seniors Open, enjoyed one of his career highs over the Old Course in St Andrews when he beat Woods 71-72 in the semi-final of the 1998 Dunhill Cup, helping Spain reach the final where they eventually lost to South Africa. “This is a different story to beating Tiger Woods,” he said. “That one was good, not because I beat Tiger, only because I got my point to get through to the final. “That was an unbelievable week with José María Olazábal and Miguel Angel Jiménez. I know that if I play Tiger 90 times he would win 89 times, but that one was mine. Torrance finished with a birdie on the last for a two under par 72, meaning Luna only had to make a par five on the 18th for victory. The 50 year old’s approach ran off the back off the green into the light rough and he left his chip 25ft short, but then putted to a foot before tapping in to claim the €43,485 first prize. For Torrance, the consolation was a first top five finish since the MCB Tour Championship at the end of the 2011 season - a performance he attributed to some advice given to him by his father Bob, the influential swing coach. “It was tough out there,” he said. “Yesterday was tough with the rain, but today was the hardest day without doubt. “I’m delighted with how I played. Thanks Dad! It’s my last tournament in my 50s so I’m pleased. 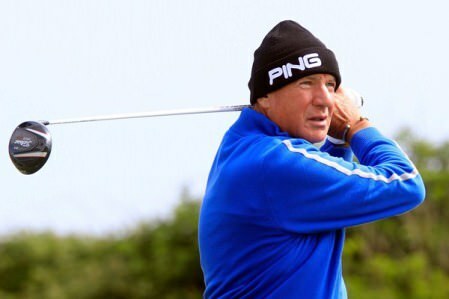 Philip Walton, picture during the Etihad Airways PGA Sprint at Seapoint, has a chance to win on the European Senior Tour. 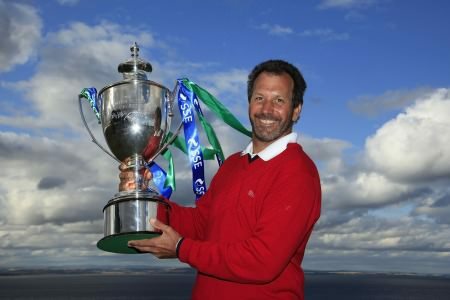 Picture: Fran Caffrey www.golffile.ie Philip Walton shot one of just two sub-70 scores to go into the final round of the SSE Scottish Senior Open with a chance to end his European Senior Tour drought.